J. C. Casely needs to drop out of college fast. It's not his grades, or the approximately $30,000 in costs per year at Berklee College of Music. It's that he doesn't want to wait for stardom. At 19, Casely has already performed at Harlem's legendary Apollo Theater, has schmoozed with celebrities at a charity event organized by Justin Timberlake, and has landed a record deal. Radio stations in Miami, his hometown, play his singles. He's halfway to a degree at Berklee, but he says staying would be riskier than leaving, especially when he considers names such as John Mayer, Melissa Etheridge, Gavin DeGraw, and Quincy Jones, artists who left Berklee without a degree and who still made it big. ''I've already kind of decided that I'm not coming back," said Casely, an Usher-esque R&B singer who arranged to take his finals early last month so he could start a short tour to promote his album around Florida. ''At my age, I feel like I need to make it happen this year." Casely's choice is not uncommon at Berklee, a performing arts school that historically has had a difficult time retaining students until graduation. About 48 percent of Berklee students get their degrees, according to the National Center for Education Statistics. Harry Chalmiers, the vice president for academic affairs, estimated that figure is up from as low as 20 percent when he was a student 30 years ago, well before the school began keeping track. Performing arts institutions across the country share the challenge of holding onto students. Locally, the New England Conservatory of Music and Emerson College have a crop of performance students who leave each year with high hopes for an immediate career and possible stardom. But as a college focusing on contemporary music, Berklee has to work even harder to keep students. While a classical musician can tout a conservatory degree for credibility, rock stars and hip-hop names rarely brag about their diplomas, according to Lawrence Bethune, Berklee's vice president of student affairs and dean of students. ''It's not hip to say you went to music college if you make it," Bethune said. ''It's not hip to say somebody else helped in your formation." Not only is it un-hip to earn a degree, Bethune said, but contemporary performance students have also feared graduation as a jinx to their music careers. ''Everybody who was famous on their roster didn't graduate," said Mike Galante, a drummer for the D.C. group Barakus, a Berklee dropout who attended the school in 1994 and who admits to avoiding a degree. ''Some of the best teachers there didn't graduate." Still, Berklee is not giving up. The school has greatly expanded its curriculum to include more nonperformance, industry training. Berklee, whose commencement will be on Saturday, was once known primarily as a jazz institution, but over the past two decades has developed extensive programs for rock, pop and R&B musicians, and has invested millions in its industry courses. The school's newest major, music therapy, added almost 10 years ago, now has an enrollment of just under 100 students, up from about 20 when the program started. Last year, there were well over 100 graduating music business students. It is now the largest major on campus, with more than 500 of the school's 3,800 students majoring in the program. Berklee's graduation and enrollment statistics reflect the success of its efforts to give students more options, but they also show a shift in student priorities. Bethune said that Berklee surveys incoming students each year, and that 90 percent or more of those starting college now say they want to complete their programs. Twenty years ago, only about 60 percent were interested in finishing. Brian Transeau, better known as BT and one of the pioneers of electronic music, is now an artist-in-residence at Berklee. He believes the expanded curriculum has made a degree more than ''just something to fall back on." BT was asked to teach at the school because of his success in working with such artists as Seal and Madonna. But in the early 1990s, he was a Berklee dropout. BT says he left the school because it didn't offer the education for electronic music he needed to further his interests. From Los Angeles, where he is currently scoring the Jamie Foxx action movie ''Stealth," BT said he would have stayed to graduate if Berklee had the classes then that it does now. Degrees aren't uncool, he said, especially if your art is technology-based. ''I think a degree can be a valuable asset," he said. ''People take it much more seriously than they would have 10 years ago." Rob Jaczko, chairman of the Music Production and Engineering Department, said that because of his program's industry focus, he experiences the opposite of a dropout problem; he calls it an ''over-retention" rate. Students retake classes and stay beyond four years to maintain their access to equipment and developing music technology. But both Jaczko and BT acknowledged that despite the success of the industry-based departments, the expanded curriculum doesn't change the basic problem for those who just wish to perform, especially singer-songwriters and rock stars in the making. Alex Rossiter, 18, said that despite Berklee's improving numbers, he is the only student in his group of rock-musician friends at Berklee who plans on a degree, and he understands why. As an electric bass player, he said, earning a degree represents delaying a touring job with a band. Many of his friends don't want to wait. ''I'd like to be one of those people who break the mold," Rossiter said, explaining why he wants his degree. ''A lot of my friends, I'll hear them say under their breath, 'I can't wait to get out of here.' "
Major ''Choirboy" Johnson, Berklee's student body president, is a walking public relations campaign for the school. Still, he has considered quitting. The Texas-bred gospel singer is squeezing his studies into three years, and said he is earning a degree mainly to set a precedent for his 13 siblings, who have yet to graduate from college. At 21, he said, he feels pressure to be out performing as soon as possible. 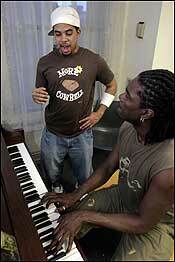 ''I'm just like, 'Berklee, y'all are taking up too much of my time,' " Johnson said. Bethune said he warns students who decide to drop out that returning to finish a degree is easier said than done. He said many of his students who are offered short-term performance jobs vow to return, but never make it back, even if their careers stall. ''Ninety percent of them I never see again," he said. But that doesn't mean dropping out is the wrong option, Bethune said. He can't deny that many of the artists Berklee brags about most, the John Mayers of the world, probably knew what was best for them. Even the faculty can't predict which students are ready to go out on their own, he said. ''Most of the John Mayers don't stand out. I'm not going to say he didn't, but most of them don't," Bethune said. ''I say to [faculty,] 'Stop playing God and saying who's going to be famous because you have no idea.' "